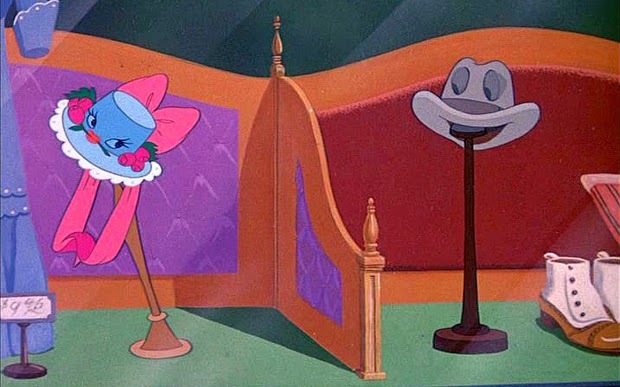 Disney Swings with "Make Mine Music"
"Make Mine Music" (1946) is a fun film, but usually overlooked. Many people don't even know about the Walt Disney Productions animated feature films of the "Package Era," which lasted for most of the 1940s. However, it was a period of great creativity and well worth the attention of any animation fan. Among other things, the studio basically invented the music video, though it wouldn't be called that for another forty years. The animators were experienced and ready to go, and, with international markets closed due to the war and its after-effects, it wasn't the proper time for grand projects such as "Snow White and the Seven Dwarfs." 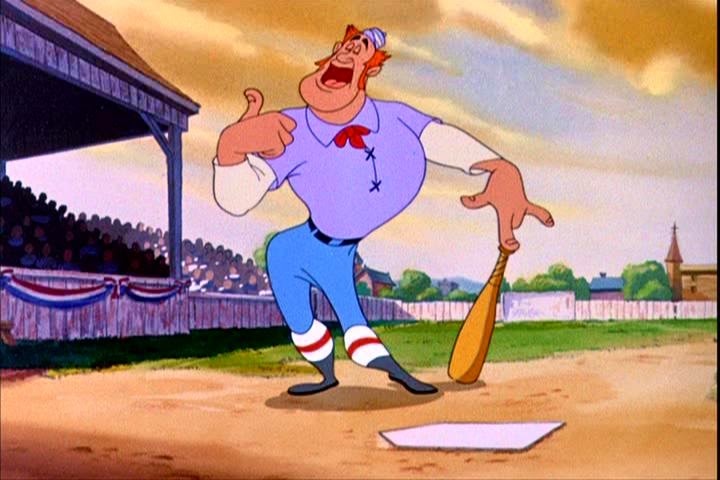 In baseball terms, it was time for "small ball," and nobody was better at that than the veteran Disney crew. Having had musical success with the first two package-era films, "Saludos Amigos" and "The Three Caballeros," Disney continued that orientation but dropped their Latin orientation, which was no longer was necessary due to the war's end and was played out by those two films anyway. 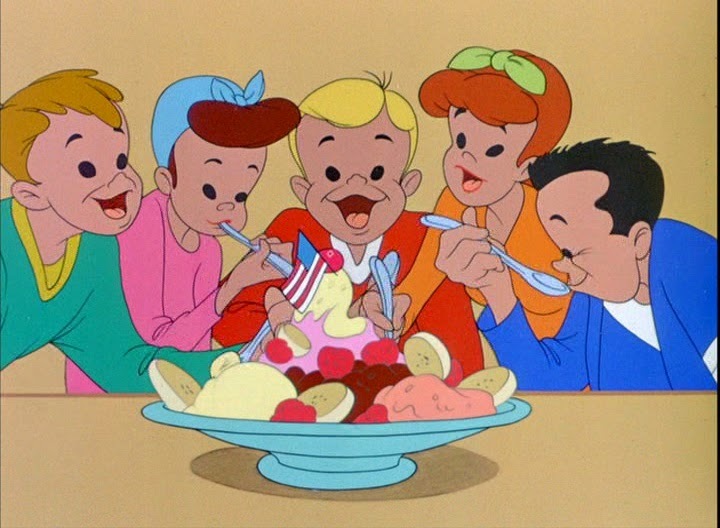 Instead, the focus shifted to domestic big bands and crooners of the era - basically, singers and classical music accompanied by vivid animation. If some theatergoers found "Make Mine Music" a bit too similar to "Fantasia" for their liking, they weren't being unreasonable: some of the material originally had been intended for "Fantasia" but had been cut. There was a decided gravitation toward popular music of the day, with no pretense of educating the audience about foreign cultures as in the earlier two package films. Artfully done, the film thus was insubstantial, but it has saved this moment of popular music history for posterity when it otherwise would have been lost. Blue Bayou - Egrets fly through the Florida swamps at night to the strains of Claude Debussy's "Claire de Lune." Peter and the Wolf - Sergei Prokofiev had just written his musical suite a decade earlier, and Sterling Holloway narrates. 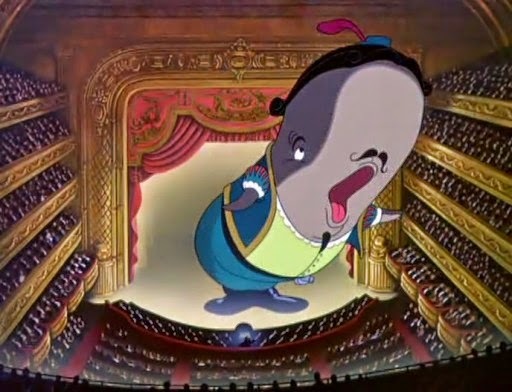 The Whale Who Wanted to Sing at the Met - A whale is a great singer (Nelson Eddy, singing from Donizetti's Lucia di Lammermoor), and wants to sing in the city's opera, but the townspeople misunderstand and try to kill him. "Make Mine Music" thus was a hodgepodge of unrelated music videos with a wide range of musical quality and world-famous artists but no overriding theme. In "Saludos Amigos" and "The Three Caballeros," there at least had been the structure of having Donald Duck learning about Latin America with the help of his friends. In "Make Mine Music" it was more like going down to the local vaudeville hall and taking in whatever happened to be going on. That some of the artists were at the top of their games, while others were about to embark on the slow road to oblivion, didn't help in terms of generating enduring appeal. Reading "Casey at the Bat" and such wasn't exactly cutting edge even then. A few years later, audiences could get as good a collection of music on an average "Ed Sullivan Show." So, it's no wonder that "Make Mine Music" quickly faded from view, and Disney hasn't even bothered to release the film in new formats in some major markets. It's a shame for "Make Mine Music" that Glenn Miller didn't survive the war, because he and his band would have made a fine addition to this collection. 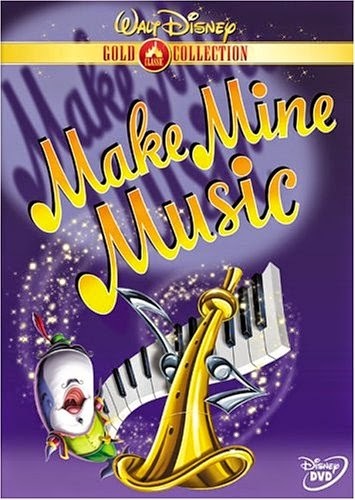 "Make Mine Music" is very light entertainment and, if made a few years later, undoubtedly would have been released as a television special (indeed, it has been shown on the Disney Channel). 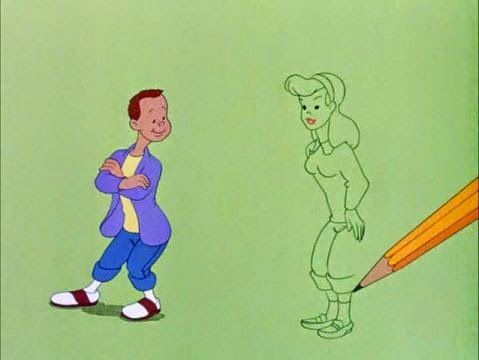 The animation is great as you would expect, and, quite frankly, the concept of music videos actually made during the big band swing era is so unique that the film is of interest for that reason alone, for that curiosity factor. Also, some of the segments, such as the one featuring the Andrews Sisters, absolutely were top grade and were later released individually. 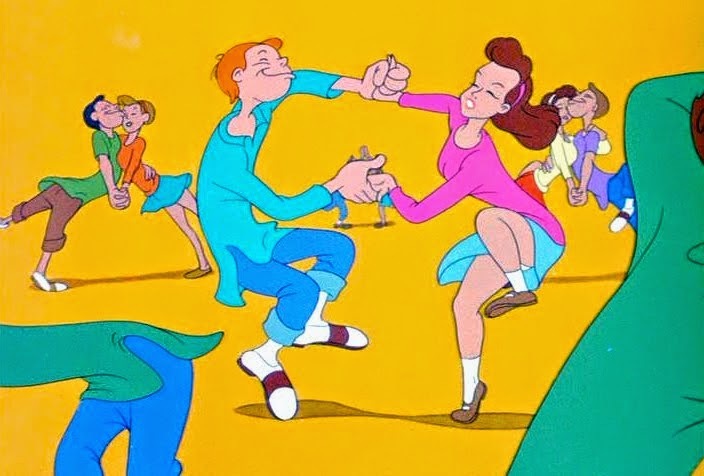 The dancing teens in "All the Cats Join In" are swingin' it, hep cat! The Goodman people sure knew how to blow that clarinet, tickle those ivories and beat those drums, daddio! As it is, thought, the entire film drags. It also shows repeated tendencies toward aspiring to "culture," which is deadly when trying to appeal to modern audiences. There are several '40s touches, like the disembodied dancing legs - or are they fingers? - such as appeared in "The Three Caballeros," that make you just scratch your head in wonder. 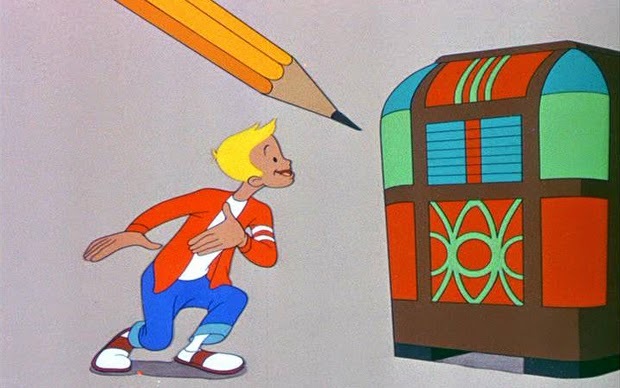 There's a fun, youthful vibe in "Make Mine Music"
Yes, the music videos are fun because, well, where else are you going to see that? But after a while, it's easy to get like John McEnroe and stand up and yell "Are you serious?" unless you're really, truly a fan of these artists and the era and the visual tropes that made sense to audiences of the time. It can be a bit hallucinatory, and whether that's good or bad depends on what you bring to the film. If you are interested, we discuss the sexual imagery of "Make Mine Music" a bit further here, with additional images from the film. Below is the trailer for "Make Mine Music" from when it was shown on the Disney Channel. And below, Benny Goodman and his crew do "After You've Gone" to the accompaniment of some artful animated juggling.